After the last day of school for term 3 I went to my grandmothers house. My little brother Izyn got me and him 2 tickets to watch a movie called Ferdinand in his schools hall. We left sometime around 5:00 pm since the movie started at 5:30 pm. When we got there Izyn saw his friends there too. There were stalls open to buy food or drinks, me and Izyn got $10 each to spend. (the tickets were $3 and everything else was $2 and under). Me and him got some things for the movie. About half way through the movie there was a 15 minute intermission for us to get other things or go toilet. After the movie we had to wait to get picked up. I had a fun time watching the movie at my brothers school. “It's tomorrow” we would reply. It was fun when we practiced and I really enjoyed doing it. Once upon a time Hansel and Gretel where strolling around in the deep dark forest. So the didn't get lost the laid down an trail of red stones ( “stones’ ). After a while of strolling in the forest they found a house made out of candy, so they started to eat the house. The house was sweet and sticky. After their feast of sweets a witch came out of the house. “Hello hello” the witch had said “Come in come in” calling to them. So Hansel and Gretel stumbled in as the door closed behind them and was locked by the witch. Hansel and Gretel sat on the couch as the witch gave them candy. The witch opened the oven pulling out a tray, she Told the kids to come as water was being boiled. Hansel and Gretel came in the kitchen waiting for more, but the witch tried to grab one to make a dish called child galore. But they escaped to the living room. Hansel got a candy broom while Gretel was still looking. As the witch came in Hansel hit her head and she went unconscious. Hansel and Gretel hurls the witch onto the tray cutting off her arms, legs and head to throw into the steaming pot of boiling water. After a while the pulled her out out the oven and took the arms, legs and head out of the pot. They placed the parts on plates and began to eat. In this activity we had to rewrite a fairy tail and change it as much as we wanted but had to keep the original characters. A lot of people know when you exercise you lose weight but it lowers your blood pressure. Exercising also can Lower the risk of heart disease, heart attack and more. Exercising also helps with you brain by pumping more oxygen to it's, increases the size of hippocampus and helps with you memory. There are many ways to exercise that even includes household activities. Basic way to do physical exercising are running and others but swimming, stair climbing, tennis, squash, or dancing can count too. Household things like extreme mopping also count. Exercising helps your brain with your memory and improves your mood and sleep while reducing your stress and your anxiety. Your heart rate and blood pressure goes down, which decreases your risk for a number of diseases you could get. If you don’t exercise you will have an shorter life. Exercise is really important physical and mentally. Go out or a run, dance or mop really hard. It's not hard but also eat healthy or have an balanced diet. If I where famous a rich I wouldn't be happy at all. Famous: Famous people would get followed by people that are fans and get interviewed by people when going somewhere. My view of a famous person is having people that look up to you, asking for a autograph, having people wanting to take photos with/of you when your just walking down the store. You can get interviewed, when inside you can be like “I just want to buy milk, leave me alone” but on the outside your like “I was just walking down to the store to get milk and other things” acting all happy but annoyed. You reach home eating cereal or something and you look out the window to see a camera and microphone pointing towards you then watching 10 people run away after filming you. You can be watching TV seeing you self on a channel. Rich: being rich can help you in some ways like buying a mansion paying bills and helping others but then you wouldn't but happy at all. Rich people buy expensive clothes, cool expensive watches and big houses but they all do they same thing. People get these cool looking watches that cost like $10K just to feel cool but a 1$ watch would do the same as a $1M. If you buy a mansion for you and your family of 5 ( you, your dad and mom and two siblings), or something with 80 rooms then your dumb, you don't need a house with 80 rooms for your family. Some people waste their money on stupid things like alcohol, cigarettes and other things. Some rich people's friends would be asking for money a lot of times which would annoy you. Woman would hang around you to try to be a friend just too get your money. So if I where rich I wouldn't be happy. If this task we had to write if being rich and famous make us happy and explain why?. Write if you would be happy or not. 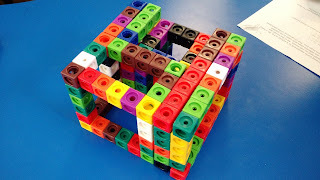 Me and justice made a 8 x 8 x 6 cube using smaller ones.